In a simpler time than our own, today’s convergence of teaching and technology would have been hard to imagine. But in the 1930s, one young man unknowingly set foot on a path leading to that intersection. A hard-working teacher had recognized his potential, then found a way to arrange a far better education than John Curtis could have hoped or paid for. Later, he vowed to repay that teacher by applying what he’d learned to the challenges teaching professionals face. Today, the assets that once provided instructional television carry digital content, and that enterprise is known as The Source for Learning, Inc. (SFL). The digital age has expanded SFL’s horizons, but its mission never changes. Teenager John Curtis, the eventual founder of SFL, enters Lawrenceville Academy thanks to the efforts of a perceptive teacher who recognized his potential. He goes on to complete a degree in engineering from Yale. He later vows to honor his former teacher by providing instructional content to teachers everywhere, free of charge. FCC reserves 31 channels for instructional use. John Curtis, now retired, begins to investigate the potential for delivering instructional video through ITFS. NASA’s CTS/Hermes satellite demonstrates the feasibility of satellite-based TV distribution. Apple, Tandy, and Commodore build-it-yourself computers go on sale. RCA introduces VHS videocassette technology in the U.S.
John Curtis founds the Network for Instructional TV (NITV), predecessor of The Source for Learning. NITV launches a broadcast video service for underserved schools in its ITFS markets. Motorola introduces the flip phone. CERN, the European Organization for Nuclear Research, puts the Worldwide Web software in the public domain. RealNetworks and Microsoft develop streaming media technology. Demand for bandwidth accelerates. NITV demonstrates the first use of ITFS channels to deliver the internet to classrooms. NITV launches TeachersFirst, our groundbreaking online web service for K12 teachers. NITV develops PreschoolFirst–the first online, formative assessment for early childhood, including an extensive library of activities to support any curriculum. Now cellphones can handle data as well as voice communication. Users and developers focus on dynamic content and social interaction. Instructional Television Fixed Service (ITFS) converts to Educational Broadband Service (EBS). The Network for Instructional Television (NITV) adopts a new identity, The Source for Learning (SFL), reflecting its mission to keep pace with advancing technology. SFL’s analog frequencies convert to broadband digital transmission. Faster network speeds make delivering video and other media more efficient. SFL collaborates with the National Head Start Association in a marketing partnership to provide resources for Head Start parents. SFL develops MySciLife—an online environment where middle-schoolers adopt science concepts as their social-media avatars—as a proposal for the MacArthur Foundation. The FCC’s Educational Broadband Service (EBS) upgrades one-way broadcast licenses to two-way digital technology to improve sharing media resources. SFL joins the International Society for Technology in Education (ISTE), an advocate for digital learning and equitable broadband access. SFL moves MySciLife to a custom-designed platform that offers “kid safe” social interaction. SFL adds new topics to OK2Ask, its series of free, interactive online workshops for teachers. 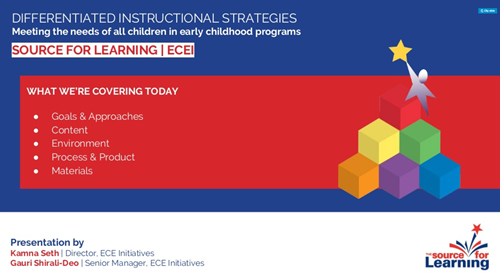 SFL's Early Education staff offer their first online webinars. Response is far greater than expected.